For other uses, see San Salvador (disambiguation). San Salvador ("Holy Savior") is the capital and the most populous city of El Salvador and its eponymous department. It is the country's political, cultural, educational and financial center. The Metropolitan Area of San Salvador which comprises the capital itself and 13 of its municipalities has a population of 2,404,097. In 1986, Mayor Morales Ehrlich closed streets in the downtown of the city to create a large pedestrian mall, which has resulted in chronic traffic congestion. Since 2009, Mayor Norman Quijano has worked for the redevelopment of parks and historic buildings in the Rescate del Centro Histórico, which involves the removal of street vendors. This has led to several riots in the area, but he has managed to place the vendors in new markets where they can operate their own stalls. The Chapultepec Peace Accords were signed on January 16, 1992, ending 12 years of civil war. The signing is celebrated as a national holiday with people flooding downtown San Salvador in the Plaza Gerardo Barrios and in La Libertad Park. The cities in El Salvador, by constitutional provision (Article 203), are economically and administratively autonomous. San Salvador is governed by a council consisting of a mayor (elected by direct vote every three years, with an option to be re-elected), a trustee and two or more aldermen whose number varies in proportion to the population of the municipality. Mayor Bukele, a member of the Farabundo Marti National Liberation Front party, is accompanied by a trustee, 12 aldermen, four substitute aldermen, and a secretary. The functions and powers of this government are framed within the rules of the Municipal Code. San Salvador's government is composed of various departments, including the departments of festivals, parks, cemeteries, and finance. To safeguard the interests of the municipality, there is a board of metropolitan agents. Each of the six city districts also has a government department. The mayor is a member of the Council of Mayors of the Metropolitan Area of San Salvador (COAMSS), composed of fourteen local councils that make up the area known as Greater San Salvador. Satellite image of Great San Salvador. East (right) of the city lies Lake Ilopango, and to the west (left) rises the San Salvador volcano. The beaches of the Central American Pacific coast (bottom) lie just south of the city. San Salvador has a tropical wet and dry climate under the Köppen climate classification, and enjoys very warm to hot weather all year round, with daily mean temperatures of 27 °C or 80.6 °F. Its weather cools from the months of November through February due to seasonal winds of the dry season. During these months one can expect a daily mean of 22.2 °C (72.0 °F). The hottest months of the year are April and May, during the transition from the dry season (November to April), to the rainy season (May to October). In April and May average maximum temperatures reach 32.2 °C (90.0 °F). The highest reading ever recorded was 38.5 °C (101.3 °F), the lowest was 8.2 °C (46.8 °F). The highest dew point was 27 °C (81 °F) and the lowest −10 °C (14 °F). Thunderstorms occur almost daily during the rainy season, mostly in the afternoon and through the night—by morning the sky clears and the days are usually sunny till the afternoon storms. San Salvador City on the foot of San Salvador volcano. The population of San Salvador is predominantly Roman Catholic, with a significant minority of Protestants. There is more diversity of religion than in most Latin American countries. The Protestant population is mostly Evangelical. One of the largest Protestant churches in the city is the Iglesia Cristiana Josue (from the Assemblies of God), another is the Tabernaculo Biblico Bautista, Amigos de Israel (Bible Baptist Tabernacle, Friends of Israel). There is also a considerable population of members of The Church of Jesus Christ of Latter-day Saints, often nicknamed the Mormons. The Mormon community in El Salvador recently built its first temple in El Salvador, a structure of impressive engineering and architecture. There are also smaller Latter-day Saints chapels in Districts 1 and 3. San Salvador, as well as the rest of the country, has used the U.S. dollar as its currency of exchange since 2001. Under the Monetary Integration Law, El Salvador adopted the U.S. dollar as a legal tender along the colon. This decision came about as an attempt to encourage foreign investors to launch new companies in El Salvador, saving them the inconvenience of conversion to other currencies. San Salvador's economy is mostly based on the service and retail sector, rather on industry or manufacturing. Centro Financiero Gigante is a complex of office buildings consisting of five towers, the highest of which is 77 meters (253 feet) tall and has 19 floors. Centro Financiero Gigante is a phased project which began with the construction of the two towers. After several years the number of buildings has increased, and it has become one of the most significant business complexes in San Salvador. The tallest tower is occupied by the Telefónica phone company, the next tallest tower is used by RED Business Communication Systems. The complex also includes the Banco Azteca center, Stream Global Services representing Dell in Central America, The Israeli Embassy of San Salvador, Tigo, call centers, and other small offices and banks. The project started in 1997 with Phase I, the construction of the two tallest towers. In Phase II a seven-story-high tower for the old Dell company in Central America was built, and in Phase III a 12-story-high tower for Tigo and a 10-story-high tower for Telemovil. The final phase was remodeling of the Telemovil building to convert it into the Banco Azteca Center. San Salvador's colonial structures, especially its colonial cathedrals, have been destroyed over time by historic earthquakes, consequently Modernist and Gothic style cathedrals have taken their place. During the Salvadoran civil war, large building construction projects were halted and eventually cancelled due to the collapse of the economy; the remainder of early Modernist office and hotel buildings collapsed during the 1986 San Salvador earthquake and the 2001 El Salvador earthquakes, while the few remaining old buildings were left uninhabitable. Only a few large structures have survived the earthquakes, including the Sheraton Presidente San Salvador Hotel and the Hilton Princess San Salvador Hotel. The seismic nature of the San Salvador area has until recently hindered the construction of high rise buildings and skyscrapers in the city; however, with new technological advances and the advent of earthquake-resistant structures, high rise buildings have begun rising over San Salvador. Today the city has monuments, plazas, stadiums, high rise buildings, large malls and cathedrals built in Gothic, Modernist, Populuxe, Googie, Streamline Moderne, Art Deco and Futurist style architecture. 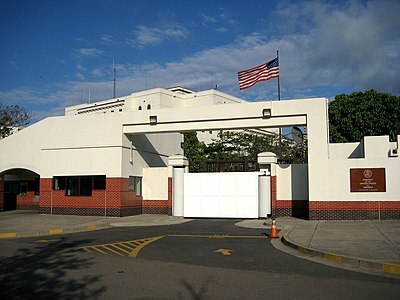 When built, the Embassy of the United States in El Salvador became the largest U.S. embassy structure in the planet. Built in the middle of the Salvadoran civil war, the U.S. embassy was constructed to act like a citadel-like compound, with highly secured fortified walls around its perimeter and several underground levels below the complex. The old U.S. embassy collapsed during the 1986 San Salvador earthquake and was abandoned. The new modern embassy to this day still stands among one of the largest U.S. embassies in the world. Despite its large size, the facility was designed with a friendly facade of traditional Salvadoran colonial house, to wear off intrusivity in the concluding Cold War years. Calle Arce (named after General Jose Manuel Arce, first president of the Federal Republic of Central America) is a major street in San Salvador. Mayor Norman Quijano inaugurated the first phase of its redevelopment near the Plaza de la Salud, which focuses on improvements to the sidewalks between 21st and 19th Avenida Norte. Twelve antique lights, originally from Spain and dating from 1900, will be installed, along with six benches and 40 trees. San Salvador has many museums. The two largest and most popular are Museo Nacional de Antropología de El Salvador (MUNA) and Museo de Arte de El Salvador (MARTE). MUNA's mission is to help Salvadorans reflect on their cultural identity through exhibitions, research, publications and educational programs in the fields of archeology and anthropology. The museum's exhibits demonstrate social processes of the various human cultural groups that have inhabited El Salvador. MARTE's mission is to contribute to development of the country's education and culture through the conservation and dissemination of its artistic heritage, and by improving historical knowledge, reaffirming cultural values that shape the Salvadoran identity, and promoting new artistic idioms. MARTE is a private, nonprofit organization, opened on May 22, 2003. Since then the museum has become an essential element of the cultural life of Central America, with its representative view of art from the mid-19th century to contemporary times. Estadio Cuscatlán, with a capacity of over 45,000, is the largest soccer venue not only in Central America, but in the Caribbean as well. It was announced on November 16, 2007, that Estadio Cuscatlán would become the first soccer stadium in Central America and the Caribbean to have a large LED screen, on which spectators can view the action. The screen is 40 meters in height and width and was completed in March 2008. The stadium was built in the early 1970s just before the beginning of the civil war, intended to jump-start an era of modernization in San Salvador, but development in the country ground to a halt during the 12 years of war. 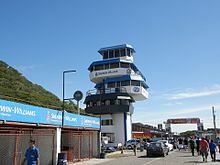 The country's primary airport is Monseñor Óscar Arnulfo Romero International Airport, which handles all international flights. It replaced Ilopango as the country's main airport in 1980. There is also a historic railroad consisting of railroad cars from the 1960s which were refurbished and put into operation by the ministry of tourism. Once a month, visitors can board the antique train and experience the way San Salvadorans transported themselves in the 1960s. During the 1980s, when political conflicts in El Salvador exploded into Salvadoran civil war, many people fled to the capital, since most of the fighting occurred elsewhere (San Salvador itself was not directly affected by the war until the final offensive of 1989). Hurricanes, tsunamis, and landslides also pose a threat. In November 2009, Hurricane Ida hit the departments of San Salvador, San Vicente and Cuscatlán. In San Vicente, the municipalities of Verapaz and Guadalupe were totally destroyed by rainfall accompanying the hurricane, and the resultant landslide. The Army and the Red Cross were able to rescue most of the victims, but many thousands of people were left homeless. The government opened public schools to be used as temporary shelters for three months. The Hurricane destroyed some bridges, and some towns lost communications. The people of El Salvador raised money for the homeless and international aid came from countries such as the United States, Mexico, Nicaragua, Guatemala, and the European Union. As of 2011[update] San Salvador had managed to reduce its crime rate, and reduce its murder rate to a level lower than that of Haiti, Venezuela, Mexico, Guatemala, or Honduras, although at over 90 murders per 100,000 residents, the per capita rate was more than 10 times higher than major cities such as New York or London. Also according to a UN Development report, San Salvador has a relatively low robbery rate of 90 per 100,000, compared to San José, the capital of Costa Rica, which has 524 robberies per 100,000. Districts 3 and 4 are the wealthiest in the country and in theory the safest but in reality, even Colonia Escalón is surrounded by marginal communities and there are countless cases of robbery and criminal activities in or around the area. Districts 1 and 2 have a slightly higher crime rate than 3 or 4, while District 5, bordering San Marcos, and District 6, bordering Soyapango, have the highest crime rates. ^ "Datos del Municipio – Gobierno de San Salvador". Gobierno de San Salvador . Retrieved July 26, 2017. ^ "Data" (in Spanish). 2009. Retrieved September 7, 2010. 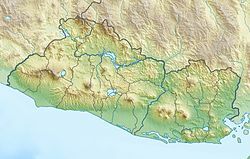 ^ "Biggest Cities El Salvador". Geonames.org. Retrieved February 24, 2012. ^ "Climatological Information for San Salvador, El Salvador". The Government of the Hong Kong Special Administrative Region. Retrieved June 7, 2016. ^ "Ilopango Climate Normals 1961–1990". National Oceanic and Atmospheric Administration. Retrieved May 2, 2017. ^ "Klimatafel von San Salvador (Flugh. Ilopango) / El Salvador" (PDF). Baseline climate means (1961–1990) from stations all over the world (in German). Deutscher Wetterdienst. Retrieved May 2, 2017. ^ Cappelen, John; Jensen, Jens. "El Salvador – San Salvador (pg 85)" (PDF). Climate Data for Selected Stations (1931–1960) (in Danish). Danish Meteorological Institute. Archived from the original (PDF) on April 27, 2013. Retrieved December 18, 2012. ^ "Station San Salvador" (in French). Meteo Climat. Retrieved May 2, 2017. ^ El Salvador: Estimaciones y Proyecciones de Población Municipal 2005–2025 (Revisión 2014) (Report). Dirección General de Estadística y Censos. September 2014. Retrieved April 25, 2016. ^ Roberto Marín Guzmán (2000). A Century of Palestinian Immigration Into Central America. Editorial Universidad de Costa Rica. pp. 42–49. ISBN 9789977675879. ^ Heidenry, Rachel. "Archbishop Orders Destruction of Salvadoran Mural". Pulitzer Center on Crisis Reporting. Retrieved February 3, 2013. ^ "Cuscatlan Park, one of the biggest urban parks in El Salvador". Explore-beautiful-el-salvador.com. Archived from the original on March 8, 2012. Retrieved February 24, 2012. ^ "VMT promete el SITRAMSS hasta 2013". Laprensagrafica.com. Archived from the original on April 7, 2012. Retrieved February 24, 2012. ^ a b "Preparan primera fase de SITRAMSS". Laprensagrafica.com. Archived from the original on April 7, 2012. Retrieved February 24, 2012. ^ "elsalvador.com, Los buseros quieren invertir en el Sitramss". Elsalvador.com. Retrieved February 24, 2012. ^ "San Salvador". Global Volcanism Program. Smithsonian Institution. ^ Harlow, David H. (e.a.) (August 1993). "The San Salvador earthquake of 10 October 1986 and its historical context". Bulletin of the Seismological Society of America. 83 (4): 1143–1154. Retrieved May 28, 2009. ^ "Significant earthquakes in 1986". Archived from the original on February 27, 2009. ^ "International Human Development Indicators – UNDP". Hdrstats.undp.org. Archived from the original on January 26, 2012. Retrieved February 24, 2012. ^ "International Human Development Indicators – UNDP". Hdrstats.undp.org. Archived from the original on January 21, 2012. Retrieved February 24, 2012. ^ "Who, What, Why: What happened to crime in New York City?". BBC News Magazine. Retrieved November 29, 2012. ^ "International Human Development Indicators – UNDP". Hdrstats.undp.org. Archived from the original on March 4, 2012. Retrieved February 24, 2012. ^ "International Human Development Indicators – UNDP". Hdrstats.undp.org. January 29, 2010. Retrieved February 24, 2012. Wikisource has the text of The New Student's Reference Work article "San Salvador".